Spaghetti al Cartoccio otherwise known as Spaghetti in Parchment. I don’t know too many people that don’t enjoy spaghetti. I mean what’s not to love after all? Long luscious noodles, that you can spin and twirl to your hearts content. Not to mention, they can be topped with a plethora (I just love that word) of sauces. Tomato, cream, meat, cheese, wine, and the list goes on and on. If I haven’t made it abundantly clear, I love pasta. Those of you that know me well know that Spaghetti alla Carbonara is my ultimate favorite last meal kind of dish. I get goose bumps just thinking about it. You also know there’s not a pasta dish that I’m not fond of ; ) Just sayin. This one included. It’s fun, kinda fancy and full of FLAVOR. 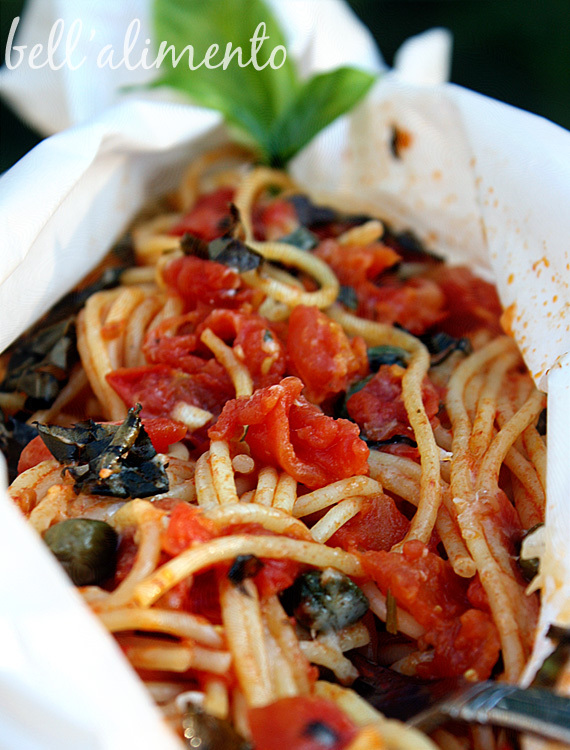 Spaghetti al Cartoccio is simply Italian for Spaghetti in parchment. If you’ve not baked with parchment this is an incredibly FUN and new way to enjoy a dish. This is a simple dish that comes together quickly. It’s a classic combination of fresh tomatoes, capers, herbs, and *smiling* Parmigiano Reggiano. Swoon! You could easily make these ahead of time and then just pop them into the oven when your guests arrive. Spaghetti al Cartoccio. 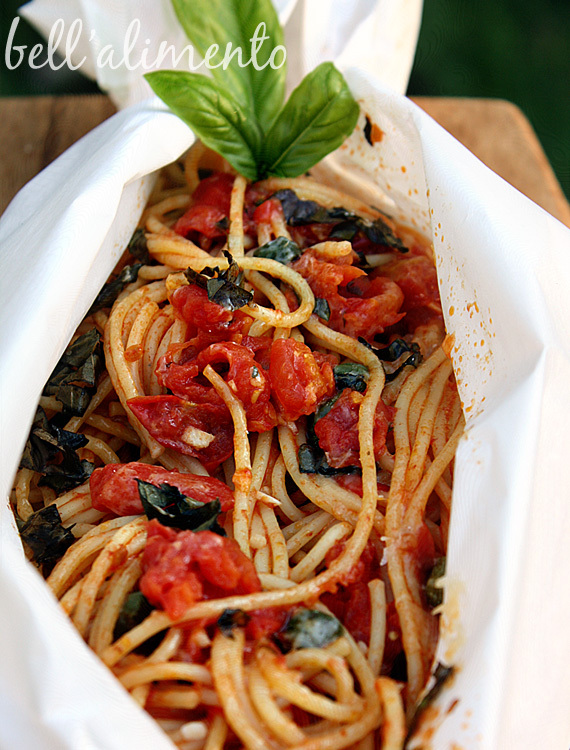 Spaghetti baked in parchment paper. Into a large saute pan add: oil, parsley and garlic. Cook over medium heat for approx 1 minute. Do not let garlic brown. Add tomatoes and wine. Season with salt and pepper. Bring to a boil. Stir often. Once boiling, reduce heat to LOW and simmer for approx 15-20 minutes. Stirring as necessary. 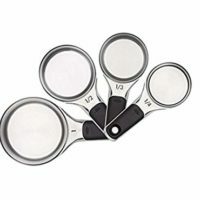 Place a large pot of generously salted water onto boil. When boiling, add spaghetti and cook until al dente. Reserve some of the pasta water in case needed. Drain spaghetti and set aside. 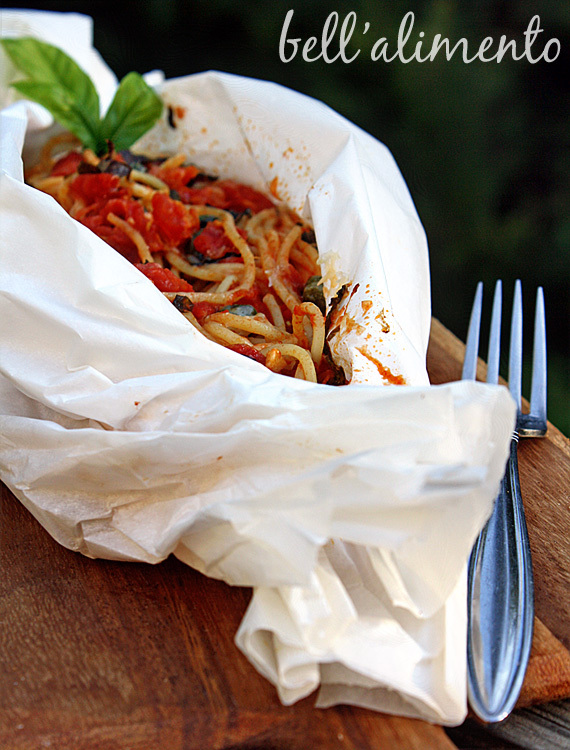 WHILE pasta and sauce are cooking, prepare your parchment paper packets. For a large packet you’ll need approx 24" of parchment paper that has been doubled for thickness. If you’re making individual packets they should be approx 6" of parchment paper (again doubled for thickness). It’s better to have MORE parchment than less. 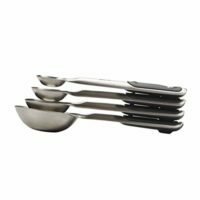 Once pasta is cooked and drained, add it to the saute pan and toss to combine. Spread spaghetti lengthwise onto the parchment paper. Sprinkle with cheese, capers & basil. Fold top of parchment paper over, like you would fold a lunch bag. Twist sides to seal. 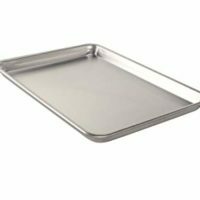 Place parchment packs onto a rimmed baking sheet. Bake for approx 8-10 minutes. Be careful when opening as steam will escape. I’ve done the Pompano en papillote, the world famous preparation originated by Jules Alciatore at Antoine’s Restaurant in New Orleans back in the 1800’s, but have never thought of using this technique for anything other than seafood. Tres magnificant et bon appetit! Super yum! I bet that smells out of this world good! This looks fabulous……..can’t wait to try it! Thanks for sharing! I can’t believe I have never heard of parchment packs…how fun! Love it, going to make it this weekend. My wife is Italian so I’m sure this one will be a winner in our house. Amazing way to do spaghetti. What a great presentation! Looks so yummy and fun! Now this is different, well done. This looks so incredibly good!!! I love the presentation! How fun. The parchment trick sounds interesting, but more importantly, the spaghetti . . . oh my goodness! Looks wonderful! Great idea. have done parchment for fish but not spaghetti. try have to give this a go. Love this idea and presentation and your photos are mouth-watering. What’s not to love, indeed! This looks delicious. Funny, in all my years of cooking I haven’t yet made this dish. May be time for a try! YUM this looks delicious! What an interesting concept, too! FABULOUS!! Very interesting (and lovely) presentation for spaghetti!